This page is about the city in the United Kingdom. For other uses, see York (disambiguation). "City of York" redirects here. For other uses, see City of York (disambiguation). York ( i/ˈjɔːrk/) is a historic walled city at the confluence of the rivers Ouse and Foss in North Yorkshire, England. 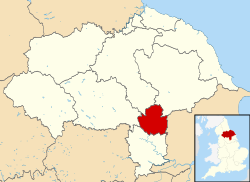 The municipality is the traditional county town of Yorkshire to which it gives its name. The city has a rich heritage and has provided the backdrop to major political events in England throughout much of its two millennia of existence. The city offers a wealth of historic attractions, of which York Minster is the most prominent, and a variety of cultural and sporting activities making it a popular tourist destination for millions. 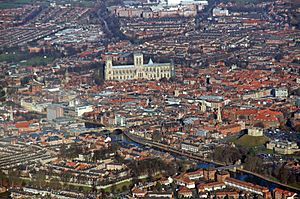 The word York (Old Norse: Jórvík) derives from the Latinised name for the city, variously rendered as Eboracum, Eburacum or Eburaci. The first mention of York by this name is dated to circa 95–104 AD as an address on a wooden stylus tablet from the Roman fortress of Vindolanda in Northumberland. The toponymy of Eboracum is uncertain because the language of the pre-Roman indigenous population was never recorded. They are thought to have spoken a Celtic language related to modern Welsh. It is thought that Eboracum is derived from the Brythonic word Eborakon, a combination of eburos "yew-tree" (cf. Old Irish ibar "yew-tree", Welsh efwr "alder buckthorn", Breton evor "alder buckthorn") and suffix *-āko(n) "place" (cf. Welsh -og) meaning either "place of the yew trees" (cf. efrog in Welsh, eabhrac in Irish Gaelic and eabhraig in Scottish Gaelic, by which names the city is known in those languages); or less probably, Eburos, 'property', which is a personal Celtic name mentioned in different documents as Eβουρος, Eburus and Eburius, and which, combined with the same suffix *-āko(n), could denote a property. In his Historia Regum Britanniae the 12th century chronicler, Geoffrey of Monmouth, suggests the name derives from that of a pre-Roman city founded by the legendary king Ebraucus. The name Eboracum became the Anglian Eoforwic in the 7th century: a compound of Eofor-, from the old name, and -wic a village probably by conflation of the element Ebor- with a Germanic root *eburaz (boar); by the 7th century the Old English for 'boar' had become eofor. Alternatively, the word eofor already existed as an Old English word for wild swine, which is a cognate of the current Low Saxon word eaver and Dutch ever. The Anglo-Saxon newcomers probably interpreted the ebor part as eofor, and -rac as ric (meaning rich), while -um was (and is) a common abbreviation of the Saxon -heem, meaning home. To them, it sounded as a 'home rich in boar'. As is common in Saxon place names, the -um part gradually faded; eoforic. When the Danish army conquered the city in 866, its name became Jórvík. The Old French and Norman name of the city following the Norman Conquest was recorded as "Everwic" (modern Norman "Évèroui") in works such as Wace's Roman de Rou. Jórvík, meanwhile, gradually reduced to York in the centuries after the Conquest, moving from the Middle English Yerk in the 14th century through Yourke in the 16th century to Yarke in the 17th century. The form York was first recorded in the 13th century. Many company and place names, such as the Ebor race meeting, refer to the Roman name. The Archbishop of York uses Ebor as his surname in his signature. Archaeological evidence suggests that Mesolithic people settled in the region of York between 8000 and 7000 BC, although it is not known whether their settlements were permanent or temporary. By the time of the Roman conquest of Britain, the area was occupied by a tribe known to the Romans as the Brigantes. The Brigantian tribal area initially became a Roman client state, but, later its leaders became more hostile and the Roman Ninth Legion was sent north of the Humber into Brigantian territory. The city was founded in 71 AD, when the Ninth Legion conquered the Brigantes and constructed a wooden military fortress on flat ground above the River Ouse close to its confluence with the River Foss. The fortress, whose walls were rebuilt in stone by the VI legion based there subsequent to the IX legion, covered an area of 50 acres (20 ha) and was inhabited by 6,000 legionary soldiers. The site of the principia (HQ) of the fortress lies under the foundations of York Minster, and excavations in the undercroft have revealed part of the Roman structure and columns. Roman Emperor Constantine the Great proclaimed Emperor at York in 306 AD. The Emperors Hadrian, Septimius Severus and Constantius I all held court in York during their various campaigns. 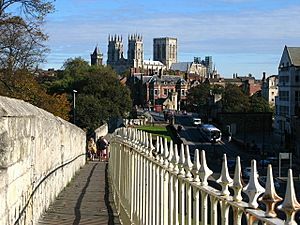 During his stay 207–211 AD, the Emperor Severus proclaimed York capital of the province of Britannia Inferior, and it is likely that it was he who granted York the privileges of a colonia or city. Constantius I died in 306 AD during his stay in York, and his son Constantine the Great was proclaimed Emperor by the troops based in the fortress. In 311 AD a bishop from York attended the Council at Arles to represent Christians from the province. While the Roman colonia and fortress were located on high ground, by 400 AD the town was victim to occasional flooding from the Rivers Ouse and Foss and the population reduced. York declined in the post-Roman era, and was taken and settled by the Angles in the 5th century. Reclamation of parts of the town was initiated in the 7th century under King Edwin of Northumbria, and York became his chief city. The first wooden minster church was built in York for the baptism of Edwin in 627, according to the Venerable Bede. Edwin ordered the small wooden church be rebuilt in stone but was killed in 633 and the task of completing the stone minster fell to his successor Oswald. In the following century Alcuin of York came to the cathedral school of York. He had a long career as a teacher and scholar, first at the school at York now known as St Peter's School, founded in 627 AD, and later as Charlemagne's leading advisor on ecclesiastical and educational affairs. In 866, Northumbria was in the midst of internecine struggles when the Vikings raided and captured York. Under Viking rule the city became a major river port, part of the extensive Viking trading routes throughout northern Europe. The last ruler of an independent Jórvík, Eric Bloodaxe, was driven from the city in 954 AD by King Eadred in his successful attempt to complete the unification of England. Micklegate – York is famous for its medieval city walls. In 1068, two years after the Norman conquest of England, the people of York rebelled. Initially the rebellion was successful but upon the arrival of William the Conqueror the rebellion was put down. William at once built a wooden fortress on a motte. In 1069, after another rebellion, William built another timbered castle across the River Ouse. These were destroyed in 1069 and rebuilt by William about the time of his ravaging Northumbria in what is called the "Harrying of the North" where he destroyed everything from York to Durham. The remains of the rebuilt castles, now in stone, are visible on either side of the River Ouse. See Peter Rex's The English Resistance, The Underground War Against the Normans, 2006. The first stone minster church was badly damaged by fire in the uprising, and the Normans built a minster on a new site. Around the year 1080 Archbishop Thomas started building the cathedral that in time became the current Minster. In the 12th century York started to prosper. 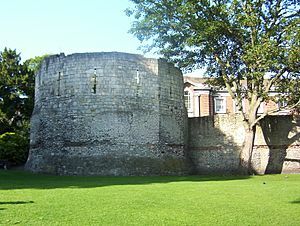 In 1190, York Castle was the site of an infamous massacre of its Jewish inhabitants, in which at least 150 Jews died (although some authorities put the figure as high as 500). The city, through its location on the River Ouse and its proximity to the Great North Road became a major trading centre. King John granted the city's first charter in 1212, confirming trading rights in England and Europe. During the later Middle Ages York merchants imported wine from France, cloth, wax, canvas, and oats from the Low Countries, timber and furs from the Baltic and exported grain to Gascony and grain and wool to the Low Countries. York became a major cloth manufacturing and trading centre. Edward I further stimulated the city's economy by using the city as a base for his war in Scotland. The city was the location of significant unrest during the so-called Peasants' Revolt in 1381. The city acquired an increasing degree of autonomy from central government including the privileges granted by a charter of Richard II in 1396. The city underwent a period of economic decline during Tudor times. Under Henry VIII, the Dissolution of the Monasteries saw the end of York's many monastic houses, including several orders of friars, the hospitals of St Nicholas and of St Leonard, the largest such institution in the north of England. This led to the Pilgrimage of Grace, an uprising of northern Catholics in Yorkshire and Lincolnshire opposed to religious reform. Henry VIII restored his authority by establishing the Council of the North in York in the dissolved St Mary's Abbey. The city became a trading and service centre during this period. Guy Fawkes, who was born and educated in York, was a member of a group of Roman Catholic restorationists that planned the Gunpowder Plot. Its aim was to displace Protestant rule by blowing up the Houses of Parliament while King James I, the entire Protestant, and even most of the Catholic aristocracy and nobility were inside. In 1644, during the Civil War, the Parliamentarians besieged York, and many medieval houses outside the city walls were lost. The barbican at Walmgate Bar was undermined and explosives laid, but, the plot was discovered. On the arrival of Prince Rupert, with an army of 15,000 men, the siege was lifted. The Parliamentarians retreated some 6 miles (10 km) from York with Rupert in pursuit, before turning on his army and soundly defeating it at the Battle of Marston Moor. Of Rupert's 15,000 troops, no fewer than 4,000 were killed and 1,500 captured. The siege was renewed but the city could not hold out for long, and on 15 July surrendered to Sir Thomas Fairfax. Following the restoration of the monarchy in 1660, and the removal of the garrison from York in 1688, the city was dominated by the gentry and merchants, although the clergy were still important. Competition from Leeds and Hull, together with silting of the River Ouse, resulted in York losing its pre-eminent position as a trading centre but the city's role as the social and cultural centre for wealthy northerners was on the rise. York's many elegant townhouses, such as the Lord Mayor's Mansion House and Fairfax House date from this period, as do the Assembly Rooms, the Theatre Royal, and the racecourse. During this general time period, the American city of New York and the colony that contained it were renamed after the Duke of York (later King James II). The railway promoter George Hudson was responsible for bringing the railway to York in 1839. Although Hudson's career as a railway entrepreneur ended in disgrace and bankruptcy, his promotion of his own railway company, the York and North Midland Railway and of York over Leeds, helped establish York as a major railway centre by the late 19th century. The introduction of the railways established engineering in the city. At the turn of the 20th century, the railway accommodated the headquarters and works of the North Eastern Railway, which employed more than 5,500 people. The railway was instrumental in the expansion of Rowntree's Cocoa Works. It was founded in 1862 by Henry Isaac Rowntree, who was joined in 1869 by his brother the philanthropist Joseph. Another chocolate manufacturer, Terry's of York was a major employer. By 1900 the railways and confectionery had become the city's two major industries. With the emergence of tourism, the historic core of York became one of the city's major assets, and in 1968 it was designated a conservation area. The existing tourist attractions were supplemented by the establishment of the National Railway Museum in York in 1975 and the Jorvik Viking Centre in 1984. The opening of the University of York in 1963 added to the prosperity of the city. 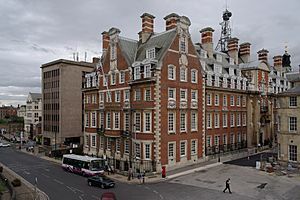 In 2010, the former headquarters on the North Eastern Railway were refurbished and opened as York's first, and still only, 5-star hotel – currently known as The Grand Hotel & Spa. York was voted European Tourism City of the Year by European Cities Marketing in June 2007 beating 130 other European cities to gain first place, surpassing Gothenburg in Sweden (second) and Valencia in Spain (third). York was also voted safest place to visit in the 2010 conde nast readers traveller awards. York was a centre of early photography as described by Hugh Murray in his 1986 book: Photographs and Photographers of York: The Early Years, 1844–79. Photographers who had studios in York included William Hayes, William Pumphrey, and Augustus Mahalski who operated on Davygate and Low Petergate in the 19th century having come to England as a refugee after serving as a Polish lancer in the Austro-Hungarian war. The city is 21 miles (34 km) from Leeds. York lies in the Vale of York, a flat area of fertile arable land bordered by the Pennines, the North York Moors and the Yorkshire Wolds The city was built at the confluence of the Rivers Ouse and Foss on a terminal moraine left by the last Ice Age. During Roman times, the land surrounding the rivers Ouse and Foss was marshy, making the site easy to defend. The city is prone to flooding from the River Ouse, and has an extensive (and until 2015 mostly effective) network of flood defences with walls along the river, and a liftable barrier across the River Foss where it joins the Ouse at the 'Blue Bridge'. In October and November 2000 York experienced the worst flooding in 375 years with more than 300 homes flooded. In December 2015 the flooding was more extensive and caused major disruption. The extreme impact led to a personal visit by Prime Minister David Cameron. Much land in and around the city is on flood plains too flood-prone for development other than agriculture. The ings are flood meadows along the Ouse, while the strays are open common grassland in various locations around the city. York Minster, a large Gothic cathedral, dominates the city. York Castle, a complex of buildings ranging from the medieval Clifford's Tower to the 20th century entrance to the York Castle Museum (formerly a prison) has had a chequered history. York's centre is enclosed by the city's medieval walls, which are a popular walk. These defences are the most complete in England. They have the only walls set on high ramparts and they retain all their principal gateways. They incorporate part of the walls of the Roman fortress and some Norman and medieval work, as well as 19th- and 20th-century renovations. The entire circuit is approximately 2.5 miles (4 km), and encloses an area of 263 acres (106 ha). The north-east section includes a part where walls never existed, because the Norman moat of York Castle, formed by damming the River Foss, also created a lake which acted as a city defence. This lake was later called the King's Fishpond, as the rights to fish belonged to the Crown. 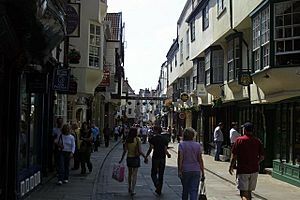 A feature of central York is the Snickelways, narrow pedestrian routes, many of which led towards the former market-places in Pavement and St Sampson's Square. 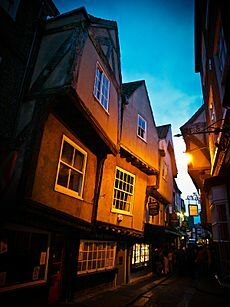 The Shambles is a narrow medieval street, lined with shops, boutiques and tea rooms. Most of these premises were once butchers' shops, and the hooks from which carcasses were hung and the shelves on which meat was laid out can still be seen outside some of them. The street also contains the Shrine of Margaret Clitherow, although it is not located in the house where she lived. Goodramgate has many medieval houses including the early 14th century Lady Row built to finance a Chantry, at the edge of the churchyard of Holy Trinity church. As well as the Castle Museum, the city contains numerous other museums and historic buildings such as the Yorkshire Museum and its Museum Gardens, Jorvik Viking Centre, York Art Gallery, the Richard III Museum, Merchant Adventurers' Hall, the reconstructed medieval house Barley Hall (owned by the York Archaeological Trust), the 18th century Fairfax House, the Mansion House (the historic home of the Lord Mayor) and the so-called Treasurer's House (owned by the National Trust). The National Railway Museum is situated just beyond the station, and is home to a vast range of transport material and the largest collection of railway locomotives in the world. Included in this collection are the world's fastest steam locomotive LNER Class A4 4468 Mallard and the world-famous LNER Class A3 4472 Flying Scotsman, which has been overhauled in the Museum. Although noted for its Medieval history, visitors can also gain an understanding of the Cold War through visiting York Cold War Bunker, former headquarters of No 20 Group of the Royal Observer Corps. York is noted for its numerous churches and pubs. Most of the remaining churches in York are from the medieval period. St William's College behind the Minster, and Bedern Hall, off Goodramgate, are former dwelling places of the canons of the Minster. York has a temperate climate with four distinct seasons. As with the rest of the Vale of York the city's climate is drier and warmer than the rest of the Yorkshire and Humberside region. Because of its lowland location York is prone to frosts, fog, and cold winds during winter, spring and very early summer. Snow can fall in winter from December onwards to as late as April but quickly melts. From May to July, York experiences the most sunshine, an average of six hours per day. Extremes recorded at the University of York campus between 1998 and 2010 include a highest temperature of 34.5 °C (94.1 °F) (Monday 17 July 2006) and a lowest temperature of −16.3 °C (2.7 °F) (Monday 6 December 2010). The most rainfall in one day was 88.4 millimetres (3.5 in). The York urban area had a population of 137,505 comprising 66,142 males and 71,363 females in 2001. The urban area's population increased to 153,717 by the time of the 2011 UK census. Also at the time of the 2001 UK census, the City of York had a total population of 181,094 of whom 93,957 were female and 87,137 were male. Of the 76,920 households in York, 36.0% were married couples living together, 31.3% were one-person households, 8.7% were co-habiting couples and 8.0% were lone parents. The figures for lone parent households were below the national average of 9.5%, and the percentage of married couples was also close to the national average of 36.5%; the proportion of one person households was slightly higher than the national average of 30.1%. In 2001, the population density was 4,368/km2 (11,310/sq mi). Of those aged 16–74 in York, 24.6% had no academic qualifications, a little lower than 28.9% in all of England. Of York's residents, 5.1% were born outside the United Kingdom, significantly lower than the national average of 9.2%. White British form 95% of the population, the largest single minority group was recorded as Asian, at 1.9% of the population. At the time of the 2011 UK census the population of York was 198,051 and its ethnic composition was 94.3% white, compared with the English average of 85.5%. York's population has a slightly higher elderly population than the national average. The table below details the population change since 1801. Christianity is the religion with the largest following in York, with 59.5% residents reporting themselves as Christian in the 2011 census. The percentages following each non-Christian religion were all below the national average for England, but those responding as "No Religion" was higher than the national average. 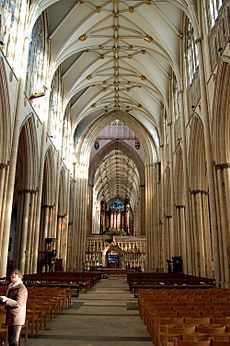 There are 33 active Anglican churches in York, which is home to the Archbishop of York and the Mother Church, York Minster, and administrative centre of the northern province of the Church of England and the Diocese of York. York is in the Roman Catholic Diocese of Middlesbrough, has eight Roman Catholic churches and a number of different Catholic religious orders. Other Christian denominations that are active in York include the Religious Society of Friends who have three meeting houses, Methodists within the York Circuit of The Methodist Church York and Hull District, and Unitarians. St Columba's United Reformed Church in Priory Street, originally built for the Presbyterians, dates from 1879. There is one mosque in York and the city also has a UK Islamic Mission Islamic centre. Various Buddhist traditions are represented in the city and around York. 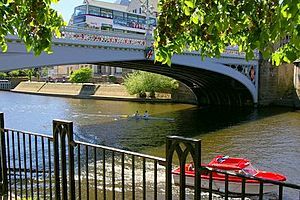 York's location on the River Ouse and in the centre of the Vale of York means that it has always had a significant position in the nation's transport system. The city grew up as a river port at the confluence of the River Ouse and the River Foss. The Ouse was originally a tidal river, accessible to seagoing ships of the time. Today both of these rivers remain navigable, although the Foss is only navigable for a short distance above the confluence. A lock at Naburn on the Ouse to the south of York means that the river in York is no longer tidal. Until the end of the 20th century, the Ouse was used by barges to carry freight between York and the port of Hull. The last significant traffic was the supply of newsprint to the local newspaper's Foss-side print works, which continued until 1997. Today navigation is almost exclusively leisure-oriented. Like most cities founded by the Romans, York is well served by long distance trunk roads. The city lies at the intersection of the A19 road from Doncaster to Tyneside, the A59 road from Liverpool to York, the A64 road from Leeds to Scarborough, and the A1079 road from York to Hull. The A64 road provides the principal link to the motorway network, linking York to both the A1(M) and the M1 motorways at a distance of about 10 miles (15 km) from the city. The transpennine M62 motorway is less than 20 miles (30 km) away providing links to Manchester and Liverpool. The city is surrounded on all sides by an outer ring road, at a distance of some 3 miles (5 km) from the centre of the city, which allows through traffic to by-pass the city. The street plan of the historic core of the city dates from medieval times and is not suitable for modern traffic. As a consequence many of the routes inside the city walls are designated as car free during business hours or restrict traffic entirely. To alleviate this situation, five bus based park and ride sites operate in York. The sites are located towards the edge of the urban area, with easy access from the ring road, and allow out of town visitors to complete their journey into the city centre by bus. York has been a major railway centre since the first line arrived in 1839 at the beginning of the railway age. For many years the city hosted the headquarters and works of the North Eastern Railway. York railway station is a principal stop on the East Coast Main Line from London to Newcastle and Edinburgh. It takes less than two hours to get to York from London by rail, with at least 25 direct trains each weekday. The station is also served by long distance trains on CrossCountry services linking Edinburgh and Newcastle with destinations in south and west England via Birmingham. TransPennine Express provide a frequent service of semi-fast trains linking York to Newcastle, Scarborough, Leeds, Manchester, Manchester Airport, and Liverpool. Local stopping services by Northern connect York to Bridlington, Harrogate, Hull, Leeds, Sheffield and many intermediate points, as well as many other stations across Greater Manchester and Lancashire. York has an airfield at the former RAF Elvington, some 7 miles (11 km) south-east of the city centre, which is the home of the Yorkshire Air Museum. Elvington is used for private aviation. Plans have been drafted to expand the site for business aviation or a full commercial service. 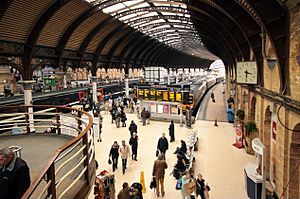 York is linked to Manchester Airport by an hourly direct TransPennine Express train, giving access to the principal airport serving the north of England, with connections to many destinations in Europe, North America, Africa, and Asia. Leeds Bradford Airport is closer to York but the hourly York Air Coach service operated by First York was withdrawn as of April 2009. Leeds Bradford Airport provides connections to most major European and North African airports as well as Pakistan and New York City. Public transport within the city is largely bus based. 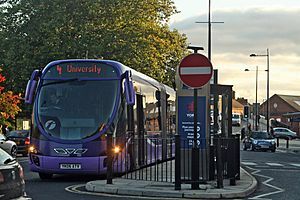 First York operates the majority of the city's local bus services, as well as the York park and ride services. York was the location of the first implementation of FirstGroup's experimental, and controversial, ftr bus concept, which sought to confer the advantages of a modern tramway system at a lower cost. The service was withdrawn following an election manifesto pledge by the Labour Group at the 2011 local government election. Transdev York and also operate a large number of local bus services. Open top tourist and sightseeing buses are operated by Transdev York on behalf of City Sightseeing. Rural services, linking local towns and villages with York, are provided by a number of companies with Transdev York, EYMS, Reliance & Stephonsons of Easingwold Operating most of them. Longer distance bus services are provided by a number of operators including, Arriva Yorkshire services to Selby, East Yorkshire Motor Services on routes to Hull, Beverley, Pocklington, Harrogate Bus Company services to Knaresborough and Harrogate. Yorkshire Coastliner links Leeds via York with Scarborough, Filey, Bridlington and Whitby. English local authorities are required to produce Local Transport Plans (LTPs), strategies for developing local integrated transport as part of a longer-term vision. LTPs are used by central government to allocate funding for transport schemes. The final Local Transport Plan 2006–2011 for York was submitted to central government in March 2006. The plan addresses the fact that traffic in York is predicted to grow considerably over the coming years. The key aims of the plan are to ease congestion and improve accessibility, air quality and safety. Major funding allocations earmarked for the first five years of the plan's life span include outer ring road improvements, improved management of the highway network, improvements to the bus network including park and ride services, provision of off-road walking and cycling routes, air quality improvements and safety measures. 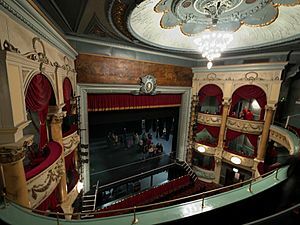 The Theatre Royal, which was established in 1744, produces an annual pantomime which attracts loyal audiences from around the country to see its veteran star, Berwick Kaler. The Grand Opera House and Joseph Rowntree Theatre also offer a variety of productions. The city is home to the Riding Lights Theatre Company, which as well as operating a busy national touring department, also operates a busy youth theatre and educational departments. York is also home to a number of amateur dramatic groups. The Department of Theatre, Film and Television and Student Societies of the University of York put on public drama performances. The York Mystery Plays are performed in public at intervals, using texts based on the original medieval plays of this type that were performed by the guilds – often with specific connections to the subject matter of each play. (For instance the Shipwrights' Play is the Building of Noah's Ark and the fish-sellers and mariners the Landing of Noah's Ark). The York Cycle of Mystery Plays or Pageants is the most complete in England. Originally performed from wagons at various locations around the city from the 14th century until 1570, they were revived in 1951 during the Festival of Britain, when York was one of the cities with a regional festival. They became part of the York City Festival every three years and later four years. They were mostly produced in a temporary open-air theatre within the ruins of St. Mary's Abbey, using some professional but mostly amateur actors. Lead actors have included Christopher Timothy and Robson Green (in the role of Christ) and Dame Judi Dench as a school girl, in 1951, 1954 and 1957. (She remains a Patron of the plays). The cycle was presented in the Theatre Royal in 1992 and 1996, within York Minster in 2000 and in 2002, 2006 and 2010 by Guild groups from wagons in the squares, in the Dean's Park, or at the Eye of York. They go around the streets, recreating the original productions. In 2012, the York Mystery Plays were performed between 2 and 27 August at St. Mary's Abbey in the York Museum Gardens. The Academy of St Olave's, a chamber orchestra which gives concerts in St Olave's Church, Marygate, is one of the music groups that perform regularly in York. A former church, St Margaret's, Walmgate, is the National Centre for Early Music, which hosts concerts, broadcasts, competitions and events including the York Early Music Festival. Students, staff and visiting artists of York St John University music department regularly perform lunchtime concerts in the University chapel. The staff and students of the University of York also perform in the city. Each September since 1997, York holds an annual Festival of Food and Drink. The aim of the festival is to spotlight food culture in York and North Yorkshire by promoting local food production. The Festival attracts up to 150,000 visitors over 10 days, from all over the country. One of the notable local products is York ham, a mild-flavoured ham with delicate pink colouring. It is traditionally served with Madeira Sauce. As a lightly smoked, dry-cured ham, York ham is saltier but milder in flavour than other European dry-cured hams. Folklore has it that the oak construction for York Minster provided the sawdust for smoking the ham. Robert Burrow Atkinson's butchery shop, in Blossom Street, is the birthplace of the original "York Ham" and the reason why the premises became famous. 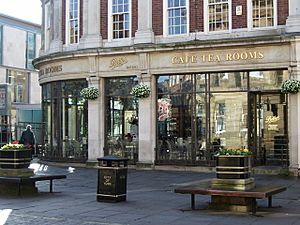 In the centre of York, in St Helen's Square, there is the York branch of Bettys Café Tea Rooms. Bettys founder, Frederick Belmont, travelled on the maiden voyage of the Queen Mary in 1936. He was so impressed by the splendour of the ship that he employed the Queen Mary's designers and craftsmen to turn a dilapidated furniture store in York into an elegant café in St Helen's Square. A few years after Bettys opened in York war broke out, and the basement 'Bettys Bar' became a favourite haunt of the thousands of airmen stationed around York. 'Bettys Mirror', on which many of them engraved their signatures with a diamond pen, remains on display today as a tribute to them. The Assize of Ale is an annual event in the city where people in medieval costume take part in a pub crawl to raise money for local charities. It has its origins in the 13th century, when an Assize of Bread and Ale was used to regulate the quality of goods. The current version was resurrected in the 1990s by the Sheriff of York and is led by the Guild of Scriveners. In June 2015 York CAMRA listed 101 pubs on its map of the city centre, some of which are hundreds of years old. These include the Golden Fleece, Ye Olde Starre Inne, noted for its sign which has spanned the street since 1733, and The Kings Arms, often photographed during floods. On 18 June 2016, York CAMRA undertook a "Beer Census" and found 328 unique real ales being served in over 200 pubs in York, reinforcing the city's reputation as a top UK beer destination. The Knavesmire, home of York Racecourse, plays host to Yorkshire's largest beer festival every September run by York CAMRA – York Beer & Cider Festival. It is housed in a marquee opposite the grandstand of the racecourse in the enclosure and in 2016 will offer over 450 real ales and over 100 ciders. In 2010 York's city council and a number of heritage organisations submitted a bid for York's entire city centre to become a UNESCO World Heritage Site. This nomination, to the UK's Department for Culture, Media and Sport would have included York on a list of tentative sites to be reviewed by UNESCO itself. York's bid failed, leading to 'disappointment' from the team involved. This indirectly led to the city making a successful bid to be part of the UNESCO Creative Cities Network as a city of Media Arts. It is the fourth of these cities, following Lyon, France; Enghien-les-Bains, France; and Sapporo, Japan. York Minster was the origin (meridian) of the 6 inch and 1:2500 Ordnance Survey maps for Yorkshire. York is twinned with Dijon, France (1953), Münster, Germany (1957) and on 22 October 2014, it announced the first 'temporal twinning' with Jórvík, the Viking city from 866 to 1066. 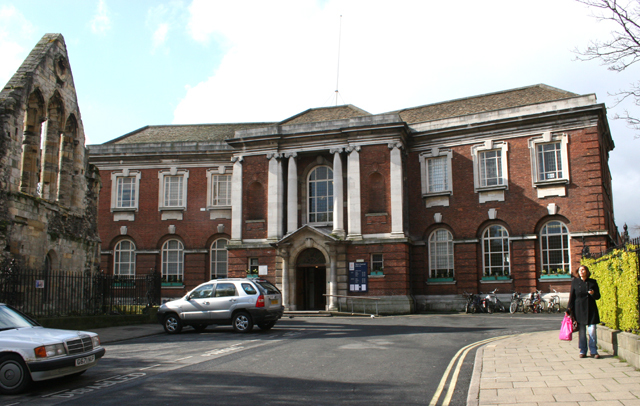 Bootham School was established by Quakers in 1823. Commerce accounts for a large part of the city's economy. The Aviva Building – York is home to the office of one major company. York Hospital is the city's primary medical facility. Bootham Crescent is the home ground of York City F.C. York Facts for Kids. Kiddle Encyclopedia.